About The Author: Kathy Keeley grew up loving cats. As an adult, she became involved in cat rescue and is still actively rescuing today. One day she happened upon a web forum for cat lovers. There she learned about showing non-pedigreed cats... household pets. She gave it a try and was hooked in no time. She has been proudly showing household pets in TICA since 1997 with great success. 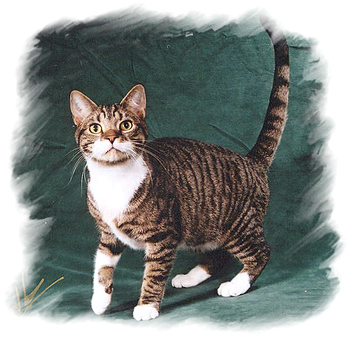 She has campaigned numerous household pet kittens and adults to regional wins, however it was not until the 2004-2005 show season that she tried a campaign with the goal of earning the title of International Winner. By season's end her kitty was TICA's 2nd Best International HHP... and was known officially as LA IW SGM (Lifetime Achievement, International Winner, Supreme Grand Master) Just Some Funky Furball... aka "Sam". 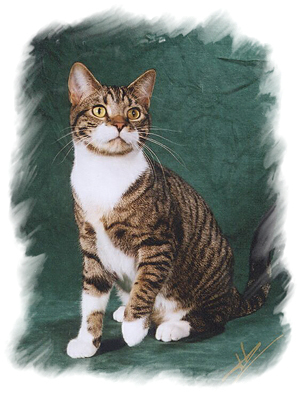 Sam is a 1 year, 6 months old Brown Mackerel Tabby and White DSH neuter owned by Kathy Keeley, Cheryl Chamberlin, & Linda Swierczynski. I have been showing household pets for many years in TICA. It was always just a fun thing to do when I was able to find a free weekend. I’ve never been fiercely competitive, and neither have my cats. I’ve been the proud owner of many regional winners, but never really entertained the thought of an International Win (except the time when I watched my Household Pet Kitten drop to 21 st after the last show of the season). I only showed locally and always within a short driving distance. This past season, most of that changed. Two friends and I were entrusted with a wonderful cat to co-own and show. We practically begged our very good friends for him, winning them over in the end. This wonderful cat's name is Sam. Sam took to showing immediately and enjoyed the judging process and all the attention he would receive. He was never stressed and was quite indiscriminate with his trust and affection. <G> I felt this was the year to run with him - to give the cat a chance to show everyone what he was all about. So I went to more shows with him than I ever had in any season. I drove further to get to them than ever before. I even entertained the thought of flying to more than one show that I considered important. My fear of flying and somewhat lacking financial situation won out and I stuck to driving. I met many new people that I now consider close friends. I’ve been to places I had never been to before. It was quite a roller coaster ride. Through it all, Sam's winning personality endured, allowing us to continue on our journey. Your cat can’t always be the best. Other people also have great cats. Always be thankful when a judge uses your cat. Tenth or Best, they liked your cat enough to final it. When your cat is not Best, remember that he/she is best in your heart - and that's where it really matters. The whole idea of showing Household Pets is to have fun showing off a cat that you adore. It’s not about you, personally. Some judges will consistently not use your cat. Respect that people have different tastes and also respect that they are consistent. Some judges will consistently use your cat. For most of us, this will change from year to year depending on the cat. Some judges will consistently use your cat up until the last minute when it is most important. <G> Say, “Oh well”, and move on. Showing your cat in top condition with good grooming is very important. If your cat is consistently unhappy, it may be best to retire the cat. Remember, this is about them, not you. Don’t hesitate to “pull” your cat from a ring if you feel the judge has mishandled the cat in the past, if a cat has a specific dislike for them, or if your cat is stressed from the show. Don’t worry about what people will say. You paid for the entry; your cat can go into whichever rings you feel it should. You have to keep the cat’s best interest at heart. If your cat is ill, please keep it home and have a vet treat it properly. Give the cat time to recover before bringing it back out. This is in your best interest, as well as that of your cat, and the cats belonging to other exhibitors. If you see someone showing a cat that is obviously ill, report it to show management, even if the cat belongs to a judge. If they do not do anything, insist that they have the cat vetted. If your cat is consistently not doing well in shows, don't imagine that it is a conspiracy against you. It is much more likely that there may be a problem with the way the cat is presented (health, grooming, condition) or with the cat’s attitude. Know that judges will sometimes final cats who are out of condition or who do not enjoy showing. This is a fact of life. Don’t take it personally. Remember that when judges use such cats in their finals, it is the judges who look bad. What do you think spectators think when they see a judge take out a household pet to present it as their best and it hisses at them and tries to bite them, or sneezes snot all over the place? Judges and show officials are not perfect. If you see something improper, point it out. It is the only way things can be corrected, or improved upon. Don’t be afraid to speak up. If you are no longer having fun, it’s probably time to take a break. This is supposed to be a fun hobby! Do your best to not play games. It will come back to haunt you at some time. Encourage junior exhibitors. They are the future of the cat fancy. Showing cats is no fun without friends. So try not to step on your friends on the way to an IW. An Allbreed Best (even in multiples) is not worth sacrificing your integrity. Your rosettes and awards are wonderful, but they will not be there when you need someone to lean on. At the end of the season… you may have a Regional Winner or even an International or National Winner. The regional and annual awards banquets are for the celebration of the wins of our cats. Try to make sure that by the time you get there, you still have friends to celebrate with. Otherwise, what was the point? When you are at home in bed and your cat is snuggled up against you, none of this truly matters. What is really important is that you have a healthy and happy cat that you love, and that loves you in return. Thank you Christian and Mike for trusting us with this wonderful boy. Cheryl and Linda, thank you for co-owning Sam and helping to show him. The biggest thank you goes to Sam. I have never known a cat quite like you, and probably never will again. Without you, none of this learning experience would have been possible. I will treasure you always. Congratulations to all the winners and thank you all for a wonderful year.